With a coastline stretching some 255 km, Terengganu has among some of the best beaches and islands in Malaysia. The beauty of the beaches is legendary, while the islands afford one of the best diving and snorkelling experiences in the region. There is a wide range of accommodation on the mainland; and most other big islands offer ample lodgings of their own, ranging from low budget chalets to international resorts. With only 6 km separating the islands from the mainland, Pulau Kapas makes for a convenient escape from modern living. It can be reached in half an hour by boat from Marang, a fishing village 17 km south of Kuala Terengganu. 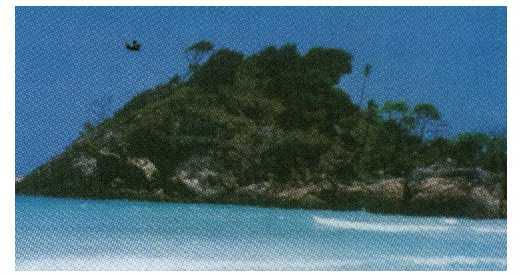 Consisting of a cluster of nine small islands, Pulau Redang is the largest of Terengganu's archipelagoes. It has been designated a Marine Park, and the island is truly a haven for underwater enthusiasts with its dazzling array of marine life. Made up of the two islands of Perhentian Besar and Perhentian kecil, the 21 km crossing from Kuala Besut takes about an hour and a half. Clear blue water and the coral reefs which fringe the islands make scuba diving the most popular activity here. This small rocky island is hot on every diver's lips at the moments, impressed by its rich marine life and crystal-clear water. The island's rich variety of reptile fauna has also made it a favourite place for scientific study. 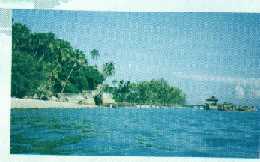 Pulau Tenggol is 17 km off Kuala Dungun, and a boat ride takes about an hour. A quiet and unspoilt island, Pulau Bidong hides many secrets. Once refugee camp for Vietnamase boat people, many tale are told of gold and other tresures lying buried with their wrecked boats in the island's waters. Pulau Bidong is only half an hour away by boat from Batu Rakit , a town 18 km from Kuala Terengganu. Lying in between Pulau Redang and Pulau Perhentian, Pulau Lang Tengah is accessible by boats from Merang. Trips take 40 minutes by fast boats, while slower ones take an hour and a half. It's far distance from the coast allows waters of high visibility, as well as rich and colorfoul marine life. Located in the district of Setiu, 90 km north of Kuala Terengganu, the beach is popular with the locals, with ample chalets and commodation for out-of-town visitors. 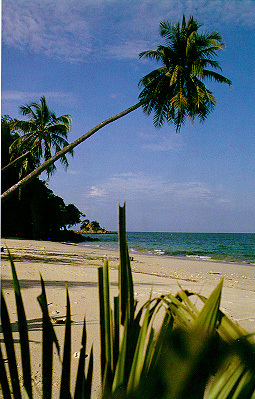 Pantai Penarik is typified by endless miles of a straight and while sandy beach, dotted with tall swaying coconut trees. About 17 km from Kuala Terengganu, the beach of Marang is famous for its rustic setting. Scenery of its fishing village, and of boats returning at dusk with the day's catch, is a favourite on postcards, as well as photographs. The beach's rocky outcrop and caves afford a view which is one of the most breathtaking in the country. Its geography also include a river which flows out to the sea, as well as a thick cover of the rainforest. With such diverse features, the beach was chosen as the site for the 18th Asia-Pacific Regional Jamboree which was held in August 1997. The beach lies 140 km north of Kuala Terengganu, near Besut. A fishing village 30 km north of Kuala Terengganu, Merang is also the jumping off point for Pulau Redang. Too often it is quickly by passed by visitors eager to reach the island. But Merang has qualities which deserve a visit on its own merits. Lagoons and coves, and small sand islands are just some of the unforgettable scenes of Merang. 56 km south of Kuala Terengganu, the beach is one of the main nesting areas for sea turtles, and one of the only six in the world to be visited by the giant leatherback. Make a visit to the hatchery centre, and find out more about the conservation and protection of these rare species. There are 40 marine parks in Malaysia, of which 11 are in Terengganu. These are Pulau Susu Dara, Pulau Perhentian Besar, Pulau Perhentian Besar, Pulau Pinang, Pulau Redang, Pulau Lima, Pulau Lang Tengah, Pulau Ekor Tebu, Pulau Kapas, Pulau Tenggol and Pulau Nyireh. Activities such as fishing, collecting corals and marine life, and anchoring boats directly on the reef are prohibited within two nautical miles of these gazetted islands. Terengganu also offers other beaches worth discovering. These include the beaches of Teluk Lipat and Teluk Bidara near Dungun, and Pantai Marina near Kemaman.